It’s been more than a month since military hero Chris Kyle died, and President Obama has yet to say a word about Kyle and his service to our country. It’s been two days since Venezuelan Hugo Chavez died, and the President has already made arrangements to send a three-man delegation to his funeral. The former Navy-SEAL was an extraordinarily heroic sniper who recorded the highest number of kill shots in American history. He claimed he was just lucky (there were so many enemies around him that it was like shooting fish in a barrel), but it’s obvious that luck was only a part of it. He was naturally talented, well-trained, meticulously prepared, and extremely courageous. Although he had nothing good to say about the barbarians he fought, Kyle never had a bad word to say in public about this country or its leaders. He truly and proudly loved America. Hugo Chavez was a “socialist” despot who wrecked Venezuela’s economy, not for the people’s benefit, but to enrich himself. Current estimates are that he squirreled away about $2 billion dollars of the Venezuelan people’s money in his own bank accounts. His favorite people were the world’s worst dictators, whether in Cuba, the Middle East, or Russia, and he tried hard to help these regimes out with the oil he robbed from his people. He aggressively supported Latin American drug and Leftist terrorist groups, and he practiced the usual dictator’s trick of blaming the Jews (who are a tiny minority in Venezuela) for the economic troubles he created. 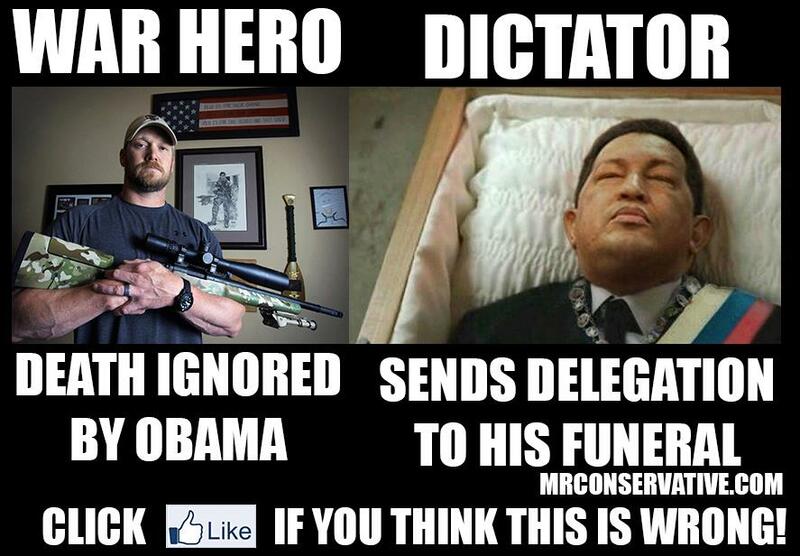 When American hero Chris Kyle died, Obama said nothing. At this challenging time of President Hugo Chavez’s passing, the United States reaffirms its support for the Venezuelan people and its interest in developing a constructive relationship with the Venezuelan government. As Venezuela begins a new chapter in its history, the United States remains committed to policies that promote democratic principles, the rule of law, and respect for human rights. When American hero Chris Kyle was mourned at his memorial service, Obama did not attend, he did not send a taped message (or even a telegram), and he did not send an official White House representative. The Obama administration has dispatched an official delegation to Caracas to attend Friday’s funeral for deceased Venezuelan President Hugo Chavez. In addition to James Derham, who presently serves as Charge d’Affaires at the U.S. Embassy in the Venezuelan capital, the State Department said Thursday that the delegation to the socialist revolutionary’s funeral will include U.S. Rep. Gregory Meeks, New York Democrat, and former U.S. Rep. William Delahunt, Massachusetts Democrat. Not to put too fine a point on things, it is disgusting that President Obama (who is the American military’s Commander in Chief) completely ignored an American military hero’s death; and now, just a month later, pulls out the stops when an anti-American, pro-terrorist, socialist robber baron dies. If you need a snapshot of the Obama administration’s values, this is it. Hugo Chavez, the former tank commander who turned the Venezuelan presidency into a lifetime post from which he could spew his anti-American, antisemitic venom, all the while sending Venezuelan’s oil supply to the world’s bad actors, died today after a long battle with cancer. It remains to be seen whether the Venezuelan people will end up saddled with someone even worse or whether his death will end the country’s unpleasant socialist interlude. Chavez was born in 1954 in Sabaneta, Venezuela, the second of six sons. His father was a schoolteacher who was closely involved with Copei, the conservative Christian Democratic Party. Chavez’s mother was the more powerful figure in this poverty-stricken family, and she had a very fraught, unhappy relationship with her son. Eventually, Chavez and his older brother ended up living with their grandmother, who filled his head with stories about a distant ancestor who was the Robin Hood of the poor Barinas region in which Chavez grew up. Another childhood inspiration for Chavez was Simon Bolivar, the 19th century patriot who helped liberate six Latin America countries, including Venezuela, from Spain. Indeed, when Chavez first became president, he changed Venezuela’s official name to the Bolivarian Republic of Venezuela. As a child, Chavez was a gifted baseball player, and his youthful dream to play in America. In fact, he joined the Venezuelan military because an army recruiter told him it was a good pathway to Major League Baseball. The military suited Chavez. In 1975, he graduated near the top of his class, entering a tank division. It was while he was in the army that the oil boom that had brought so much money to Venezuela went bust. Seizing upon the resulting civilian discontent, would-be revolutionaries infiltrated the Venezuelan military in the hopes of fomenting a Leftist military coup. Chavez, despite his father’s conservative politics, had swung to the Left. By 1983, he was forming secret cell’s with like-minded military officers. These officers were dismayed when, in 1989, then-president Carlos Andres Perez enacted pro-market reforms. These reforms, however, were followed by a fuel price increase that caused wide-spread looting in Caracas. Within the army, many, including Chavez, believed that Venezuela could be saved only with strong, preferably military, leadership. In the wake of the coup attempt, Chavez was sent to prison, but his sentence was commuted in 1994. Upon his release, Venezuelans craving a strong alternative to Venezuela’s famously corrupt government, flocked to him. Chavez, meanwhile, looked to Castro for guidance, while Castro looked to Chavez as a useful puppet to have on mainland Latin America. When Chavez ran for president in 1998, he won by a landslide. One of his first acts was to call for a constitutional election so that he could run for a second term — and run he did, with a second election win. Once in power, Chavez doubled down on class warfare and on efforts to expand government into every region of life in Venezuela. Middle-class Venezuelans were sufficiently worried that, by April 2002, they staged a massive demonstration against him. The army refused to shoot the rioters, forcing Chavez to resign. His resignation lasted a mere 48 hours before his supporters from the barrios staged a counter-demonstration that swept him right back into office. Having resumed power, Chavez purged military ranks and went about breaking the back of his country’s other power center — oil. He succeeded in doing so, but at terrible cost. After he fired 19,000 oil company employees, Venezuela was never again able to return to its former peak oil production. Rising oil prices over the last few years, however, helped offset the decrease in production and kept money flowing into Chavez’s pockets. With this cash flow, Chavez was able to get returned to office two more times. He died during his fourth term in office. On the national stage, Chavez became a thorn in the flesh of freedom-loving people at home and abroad. At home, he achieved a half-socialist, half-fascist rule, insofar as he nationalized some businesses, while leaving others in private hands but under government control. His policies resulted in devastating inflation and huge foreign debt. Eventually, the only profit center in the country was oil (and, as noted above, Chavez’s policies meant less production of this vital asset). Chavez’s greatest achievement, and the one that saw him become so popular despite the damage he caused to the economy and civil liberties, was to enfranchise thousands of Venezuela’s poorest, while at the same providing them socialized education, health care, and welfare programs. Typically for such programs, while they looked good, and enticed voters, the net effect was negligible. Crime rose and individual wealth fell. The poor had slightly more education and health care, but much less money and more crime-ridden communities. Venezuela’s Jews did not fare well during Chavez’s rule. His populist Leftism included fomenting tried-and-true class- and economic-based attacks against Jews. Once Chavez realized that there was no medicine in Cuba or Brazil that would cure, or even slow, his cancer, he made it clear that he intended Nicolas Maduro to become his political heir. In the upcoming election, Maduro will almost certainly face off against opposition governor Henrique Capriles, who lost to Chavez in last October’s president’s election, but did manage to hold on to his governor’s seat. It remains to be seen whether Chavez’s popularity will rub off on Madura, or if Capriles will be able to break this regime’s hold on the office. Hugo Chavez has finally succumbed to cancer. Normally when I write a post heading highlighting someone’s death, I add a “RIP” to the post title. That seemed inappropriate here, given that my very first thought when I read that was dead was “Good Riddance” — hence the “GR” in the post caption. 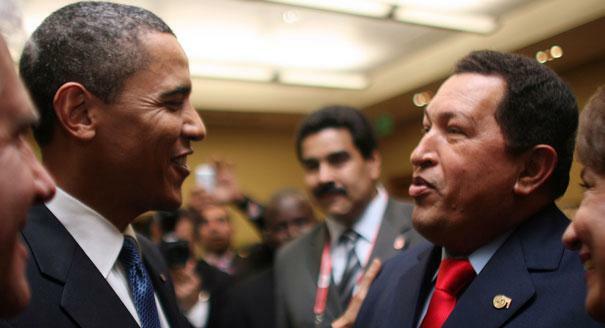 Chavez was a dreadful man from first to last. He destroyed any vestige of civil rights that Venezuelan citizens once had, he threw himself (and his country’s oil) in the open arms of the world’s worst actors, and he actively encouraged antisemitism within Venezuela’s borders. He also tried to destabilize Latin America as a whole and bring it into his totalitarian, anti-American, antisemitic orbit. Given all the marks in the “con” column of his life’s achievement, and the total absence of any marks in the “pro” column, I’m not at all sorry he died. I’m only sorry he didn’t die sooner. Nature shouldn’t have taken so long in purging the earth of his presence. And proving that my vindictiveness hasn’t been fully spent reviling Chavez, let me add that I wish Nature would hurry up when it comes to hastening the passing of such other evildoers as Castro, Jong-Un, and Ahmadinejad and his Ayatollahs. It’s entirely possible that, were they to meet their Maker (or just decompose in the ground) their replacements would be even worse. However, what one hopes is that a dictator’s passing creates a tiny window of space and hope within which people of good will can act to save those of their fellow citizens straining under the yoke of a totalitarian dictatorship. Please note that I am not asking that these leaders be assassinated or that we wage war against them. Chavez died of natural causes. The others should too . . . only very quickly. At Simply Jews, you can read about what happened when one man tried, in a somewhat vulgar way, to exercise free speech in Venezuela. Venezuelans, by the slimmest of margins, rejected a constitutional referendum that would have allowed President Hugo Chavez to seek re-election indefinitely and tightened socialism’s grip on the oil-rich Latin American nation. By 51 percent to 49 percent, voters shot down a referendum that included 69 proposed amendments to the 1999 constitution, according to Monday reports from the National Electoral Council. In all, 9 million of Venezuela’s 16 million eligible voters went to the polls. “Don’t feel sad. Don’t feel burdened,” Chavez told supporters after the results were announced. In Washington, the White House applauded the vote. “We congratulate the people of Venezuela on their vote and their continued desire to live in freedom and democracy,” said National Security Council spokesman Gordon Johndroe. Thousands of Venezuelans gathered in the streets of Caracas, many of them university students who worked to defeat the measure, and burst into singing their country’s national anthem upon hearing the news. Chavez, of course, has proven himself crazy like a fox, so one can only wonder what his next step will be.